This experience is something else! Come and experience the healing vibrational and relaxing power of a gong bath. You are literally bathed in amazing sound vibration. I invite you to my beautiful healing room in Burton Latimer. Lay down comfortably on a beautiful futon and feel warm under soft quilting. Rose quartz crystals with candles inside are placed either side of your head – for peaceful loving energy! First you are guided through a verbal deep relaxation into a totally calm state of mind, attention is given to taking you into this relaxed state through breathing and visualisation techniques. 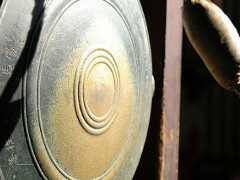 Once calm, the GONG will start and you will experience vibration in a very unique way – vibration heals. The power of Mantra & Nada (sound) is great for calming and focusing the mind. On a physical level, vibration is used by health care professionals through UltraSOUND, to promote healing from injuries. It works and so does gong. The gong is played in a way that releases different pitches and waves of vibration, along with the sound of the beautiful singing bowl & tingshas. It helps to release energy blocks on the subtle levels and resonate deep into the physical body to help healing in many ways. The sound is crafted to produce an ambience that allows the mind the freedom for healing. This therapy really is an experience to be had.